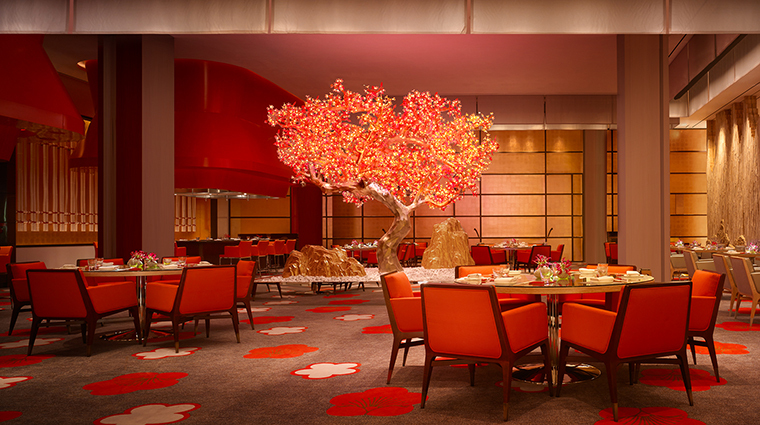 Mizumi at Wynn Palace aims to epitomize the Japanese concept of omotenashi, the art of anticipating the needs of and satisfying your guests. With a team of master chefs from Japan and ingredients flown in daily from the homeland, Mizumi offers three of the country’s staples: tempura, teppanyaki and sushi. Mixing traditional Japanese décor with contemporary additions, the restaurant space is undeniably Japanese but with flourishes that are both typical of Wynn and atypical of many other Japanese restaurants in the city. The gilded cherry tree sculpture in the center of the room, which cycles through the seasons thanks to LEDs, perhaps illustrates this. The orange lacquered hoods of the two teppanyaki stations are other examples. Aiming to differentiate Mizumi from other Japanese fine-dining establishments in Macau, the selection of sake is, according to Wynn, incomparable, with several that are exclusive to Mizumi. With such qualified chefs, it is advisable to put yourself in their hands. Three teppanyaki omakase (chef tasting menu) selections allow you to do just that. The entrance to Mizumi is as theatrical as what you will experience inside, thanks to a contemporary rock garden and the modernized Japanese courtyard. The blend of natural materials with steel and glass hint at what is to come inside. Stacked floor to ceiling with traditional tansu cabinets, the three private rooms are both beautiful and interesting. Able to accommodate just eight diners per room, they add an intimacy to the Mizumi experience. The sake collection is excellent, so be sure to opt for pairings with your meal. For those with less than an extensive knowledge of sake, listen to the advice of the in-house sake sommelier. For those who don’t like sake, the sommelier can also suggest whiskey, cocktail and even craft beer pairings. If you’re considering experiencing the teppanyaki show, be sure to book well in advance, as there are only 24 seats at the two stations. Although Mizumi offers theatrics and children are welcome, it is still a fine-dining restaurant with a strict dress code. Executive chef Min Kim is in charge of Mizumi, Sushi Mizumi and the ramen-dedicated restaurant Hanami. The Korean chef’s impressive resume includes stints at W Seoul Walkerhill, Tokyo restaurants Narisawa and Ryugin, and Sydney’s lauded restaurant Sake Double Bay. Mizumi is closed on Mondays. While the majority of the menu is very traditional Japanese, the contemporary nature of Mizumi is represented with dishes such as Japanese-style pen shell ceviche and the truffle and potato croquette. There is also a small selection of robatayaki options at Mizumi. Everything from asparagus to scallops are skewered and grilled over hot charcoal. Sushi and sashimi range from the simple and inexpensive tamago (an omelet-type preparation) to Hokkaido sea urchin at the other end of the luxury scale. With more than 70 different sakes to choose from and an in-house sake sommelier, Mizumi attracts connoisseurs of the Japanese rice wine. Those connoisseurs, however, should know that at Mizumi, sake is served in wine glasses and not the traditional ochoko cups. The sake list includes Matsu no Tsukasa Black Azolla and Junmai Daiginjo, one of the most sought-after sakes outside Japan with only 400 bottles produced. The list was compiled by the in-house sake sommelier with the assistance of the only Master of Wine in Japan recognized by the Institute of Masters of Wine. Aside from sake, there is a wide range of other drinks, including more than two dozen small-batch Japanese whiskeys, cocktails made specifically to pair with the food on offer, and even a range of Japanese craft beers.